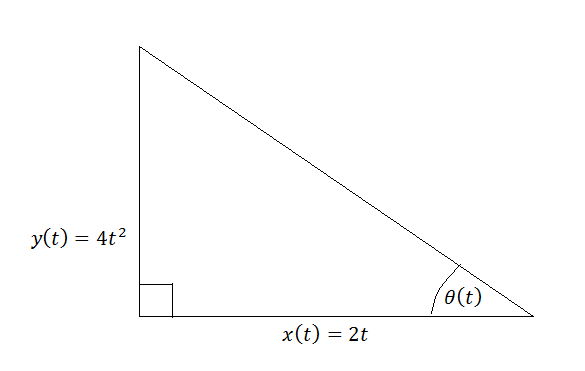 a) Find the rate at which the angle opposite is changing with respect to time. Find the rate at which the angle opposite is changing with respect to time. Now we need to differentiate with respect to . Soap is sometimes used to determine the location of leaks in industrial pipes. A perfectly spherical soap bubble is growing at a rate of . What is the rate of change of the surface area of the bubble when the radius of the bubble is ? To determine the rate of change of the surface area of the spherical bubble, we must relate it to something we do know the rate of change of - the volume. A pizzeria chef is flattening a circular piece of dough. The surface area of the dough (we are only considering the top of the dough) is increasing at a rate of 0.5 inches/sec. How quickly is the diameter of the pizza changing when the radius of the pizza measures 4 inches? To find the rate of change of the diameter, we must relate the diameter to something we do know the rate of change of: the surface area. We could have found this directly by writing our surface area formula in terms of diameter, however the process we used is more applicable to problems in which the related rate of change is of something not as easy to manipulate. A spherical balloon is increasing in volume at a constant rate of . At a radius of 3 cm, what is the rate of change of the circumference of the balloon? To determine the rate of change of the circumference at a given radius, we must relate the circumference rate of change to the rate of change we know - that of the volume. The chain rule was used when taking the derivative of the radius with respect to time, because we know that it is a function of time. Determine the rate of change of the angle opposite the base of a right triangle -whose length is increasing at a rate of 1 inch per minute, and whose height is a constant 2 inches - when the area of the triangle is 2 square inches. To determine the rate of the change of the angle opposite to the base of the given right triangle, we must relate it to the rate of change of the base of the triangle when the triangle is a certain area. Find the car's acceleration when . To find the car's acceleration, take the SECOND derivative of . A point on a circle of radius 1 unit is orbiting counter-clockwise around the circle's center. It makes one full orbit every 8 seconds. How fast is the coordinate changing when the line segment from the origin to the point, , forms an angle of radians above the positive x axis? This is a related rates problem. Since the problem gives the time for one orbit, we can find the angular speed of the point. The angular speed is simply how many radians the particle travels in one second. We find this by dividing the amount of radians in one revolution, , by the time it takes to travel one revolution, 8 seconds. This gives us the change in the angle with respect to time, . , where r is the radius. Now we have a formula that relates the horizontal speed of the particle at a instant in time, , to the angle above the positive x axis and angular speed at that same instant. We are told to find how fast the x coordinate is changing when the angle, is radians above the positive x axis. So we will plug in for . However we also need to know . Fortunately, we already found it. It is the angular speed, radians/second. This is the answer. The negative makes sense, because the point is traveling counter-clockwise. Hence, it is moving left when the angle is radians. A man is standing on the top of a 10 ft long ladder that is leaning against the side of a building, when the bottom of the ladder begins to slide out from under it. How fast is the man standing on the top of the ladder falling when the bottom of the ladder is 6 ft from the building and is sliding at 2ft/sec? This is a related rates problem. The ladder leaning against the side of a building forms a right triangle, with the 10ft ladder as its hypotenuse. The Pythagorean Theorem, relates all three sides of this triangle to each other. Let be the height from the top of the ladder to the ground. Let be the distance from the bottom of the ladder to the building. Since 10 is the hypotenuse, we have the following equation. Since and are variables, we will wait to plug values into them until after we take the derivative. The question asks how fast the man standing on the top of the ladder is falling whenthe ladder's base is 6ft from the building and is sliding away at 2 ft/sec. These two values, and , only happen at a single instant in time. So we will find the derivative of the equation at this point in time. We only care about the instant that and . We need to find the rate that the top of the ladder, and thus the man, is falling. So we want to solve for . However, we will need to know what is at this instant in order to find an answer. Fortunately, the Pythagorean Theorem applies at all points in time, so we can use it for this particular instant to find . Since we are dealing with physical distances, we will only use the positive 8.
, where is the time in hours. If the car starts out at a distance of 3 miles from its home, how far will it be after 4 hours?